Panama is located in the center of the Western Hemisphere, limiting on the north with the Caribbean Sea, on the south, with the Pacific Ocean, on the east with Colombia and on the west with Costa Rica, forming a link between Central America and South America. The total area of the Republic has an extension of 75,517 square kilometers. 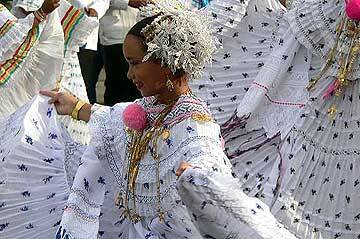 Languages: Spanish (official), English 14% note: many Panamanians are bilingual. What currency is used in Panama ? The currency is the "Balboa" which is the same value as the US dollar. The US dollar is legal tender in Panama, which doesn't print bank notes ( US dollar notes are used ) but only mint its own coins. 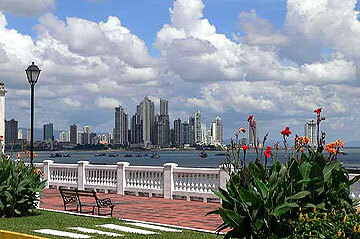 How is the climate in Panama ? 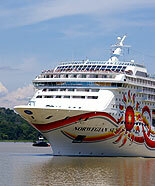 Panama has a tropical climate. Temperatures are around 80 - 90 degrees Fahrenheit ( 25 - 30 Celsius ) and humidity is always high. There are only two seasons, the dry season from December to April and the rainy season from May to the end of the year. What else is important ? Electricity: 120V 60 Cycles in all parts of the country. Political System: A democratic independent republic. Highest point: Volcan Baru 3475 m.
How many islands are in San Blas: over 365. For more info from Panama see related links.